» Harrison Ford Is Interested in Reviving Han Solo — Possibly in Order to Kill Him?! Harrison Ford Is Interested in Reviving Han Solo — Possibly in Order to Kill Him?! Between now and 2015, when the first new Star Wars movie is slated to drop, we will be privy to a moderate-to-gushing torrent of tidbits, reminiscences, rumors, innuendo, and, every once in a while, actual news from the galaxy far, far away. And this week’s most pressing development? 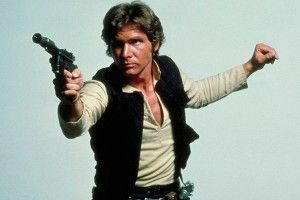 Harrison Ford — the one original Star Wars principal who, as you may recall, became a full-fledged movie star after Return of the Jedi — is not totally against the idea of returning as your favorite smuggler’s favorite smuggler, mf’ing Han Solo. Hell. Yes. EW has a source that says “Harrison is open to the idea of doing the movie and he’s upbeat about it.” Not exactly a firm commitment, no, plus EW points out that the next level of contract talks won’t go down until there’s a script and a director in place, and that might be a while. Also, EW speculates, somewhat wildly, that a “mandatory death scene” might be in Harrison’s contract. What the hell? I was very happy to be involved. I was pleased to be a part of an ensemble.” So, implicit here is that Ford might be interested in returning specifically because Lucas won’t be around. So will he really want to return as a one-and-done, popping up only to give Solo the noble death he still craves? Or can he be convinced to come back as a steady presence in all three installments of the new trilogy? Seems like we’re years away from finding out for sure — but let’s hope. And for anyone cringing while thinking back to the last time Ford revived a beloved, timeless, epically awesome Lucasfilm hero (in a movie that shall not be named), we should point out that this wouldn’t be the same thing. With Han, Ford wouldn’t be expected to carry the whole thing, just to appear as a complementary smirking, well-aged cool-guy presence; maybe he pops off the blaster a couple times, maybe he makes few clunky hyperspace jumps. Who wouldn’t want to catch up with cranky Han Solo in his middle age? By the way, if his contract also insists on a major role for his lady Ally McBeal, I reserve the right to take this all back.